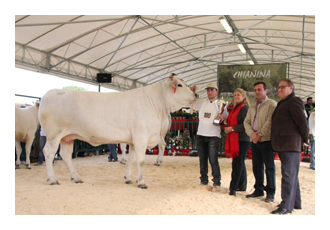 Recently, in March of this year, a group of Australian Chianina cattle breeders travelled to Italy to attend the National Chianina Show in Bastia Umbra – Perugia. This show was particularly important as it was the 50th Anniversary of the incorporation of the National Breed Association, ANABIC. 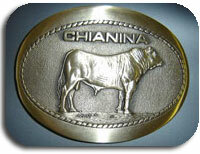 There were over 200 entries of Chianina cattle of all ages and of the latest genetics. The Australians who attended were Tim Titheradge, President of the Chianina Society of Australia and his partner, Natalie, NSW; John Adams, Past President and Treasurer and Cecily Adams, VIC; Sally Crosby, Past Secretary and Lex Crosby NSW; Daniela Mollica, VIC. It is to be hoped that as a result of this trip, embryos will be imported to Australia bringing new genetics to the Chianina in this country. Chianina cattle have been bred in Australia for nearly 40 years and have made a significant contribution to the Country’s cross bred cattle. With characteristics of growth, structure, ease of calving, eye muscle area and carcass yield, they have been well regarded as an ideal terminal sire by breeders and processors alike. They are considered the world’s largest cattle, as can be seen by the cow in the photograph. 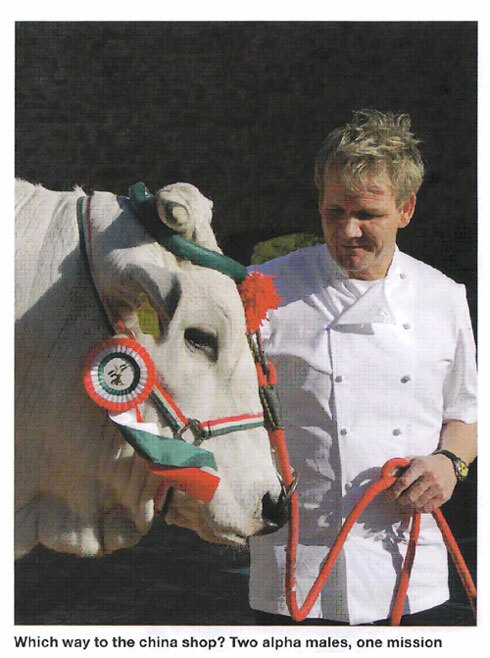 As a matter of great honour, John Adams was asked to Judge the Best Animal in Show and chose this cow. She is 6 years old Ramona Di Moglio, and weighed in at 1260kgs. She is sired by one of Italy’s best of its current line-up of top bulls, Lio Di Maria Bianca. Mr Adams said of her that “she was as near to perfect as a representative of all that is good in the maternal line of Chianina. I would like to take her home in my suitcase, but perhaps some embryos would do instead”. The Australian Breeders are keen to keep up with the latest genetics of a breed that was believed to have originated from cattle brought from Asia and Africa to Italy in about 2500BC. Developed to pull ploughs and as a source of food during the Etruscan and Roman periods, the Chianina is one of the oldest if not the oldest, purebred cattle breeds in the world. This latest excursion by breeders should ensure the Chianina’s future in Australia, for years to come. Caption for Photo : R to L John Adams, Fausto Luchetti, President ANABIC, Cecily Adams and handler with trophy for Best in Show.